The best of classic beauty wisely coupled with a contemporary look. Smooth movements of today’s trends flowing into tomorrow’s home. Simple lines creating spacious and dynamic structures. Chest of drawers and bedside tables with shaped solid-wood framework, entirely hand-made decoration and patination. Laser-cut and hand-cambered iron handles. The elegant curvilinear front of this three-drawer commode or chest of drawers is complimented by delicate hardware and whorl feet. Dimension cm 107 x 81 x 61 cm Dimension in 42 x 32 x 24 in. Graceful commode has a curved apron atop cabriole legs, beautifully detailed hardware and key escutcheons. Three drawers. Dimension cm 100 x 85 x 53 cm Dimension in 39 x 33 x 21 in. MONTMATRE A neo-classic cabinet with mirrored chest comprising of three centrally positioned drawers enhanced by faux-drawer side doors, also available in a side table version. 6-drawer unit in old wood with handles and corners made of recovered vintage leather. Creative white Snowy decor that will bring a new light into the living room. The Matilde bookcase is comprised of a large central element and two side columns with prestigious handmade decorations. Tender is the night Sophisticated decorative concepts to dream about, awake or asleep. A princely proposal for your bedroom with all precious details and various elements to match where Italian quality and taste rule. A timeless piece, the Glamour chest of drawers is a classic creation that gives the finest materials an impressive sense of elegance. BLACK LACQUERED BEECH Four bowed drawers, acorn handles in lacquered brass, ball feet. classical style, 4 drawers. Solid sections in American tulipwood, veneered in multi-ply poplar and poplar root. Fillets in multicoloured woods. Style:Italy 19th century Details: Plume walnut, Inlays, Drawers Dimension: cm. 125 x 53 x 91 h. 49¼" x 20¾" x 35¾" h.
Finishing of the structure Glossy Lacquered Ghiaccio; front door Glossy Lacquered Ghiaccio; handle MROSA Bianco. Detail on bottom: Bedside table with handle MASWAR. Dresser and nightstands in solid wood available in different colours. A classic chest of drawers is a piece of furniture with drawers, whose form, construction or materials are associated with a particular epoch or style period. There are both tall and low models, some with legs. 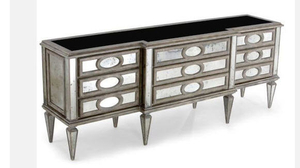 These pieces are used in domestic or commercial settings to add a touch of interest or luxury. They are used for storing clothing, linen or other items. They are sometimes found in waiting rooms or corridors for decoration, displaying objects or information, or to hold a telephone or other frequently-used items. This furniture is often made out of solid wood, including oak, teak and pine. Decorative or protective finishes include wax, varnish, lacquer, veneer and carving. Consider whether the classic chest will be a unique piece or match other furniture of the same style. Dimensions should be appropriate for the space, providing sufficient storage capacity while allowing drawers to open completely. Other factors include sturdiness and maintenance requirements. Ensure that the drawers can handle the weight of items to be stored, are durable and easy to use.